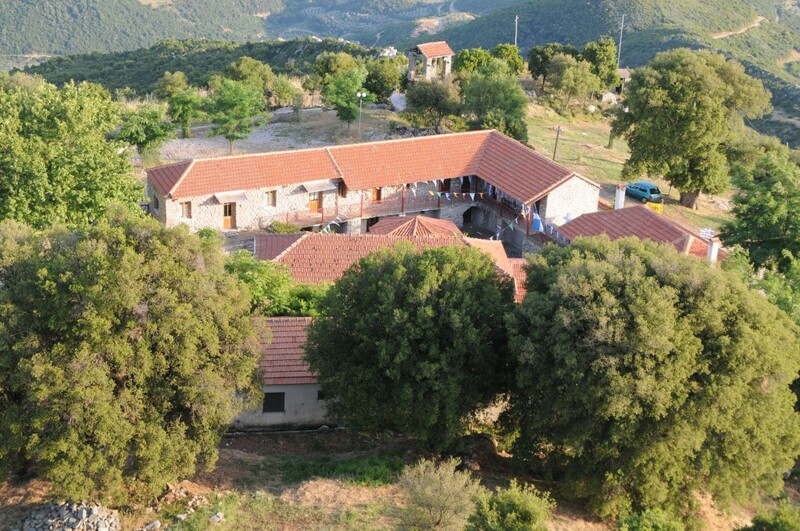 Up the mountain where the ancient city of Thestieis is located, in the region of Aitoloakarnanias, a few kilometers before Agrinio, is the Monastery of the Panagia the Vlochaitissa with its wonderworking icon. The icon gets its name from the location of the monastery, which is officially called the Monastery of the Dormition of the Theotokos in Vlochos. 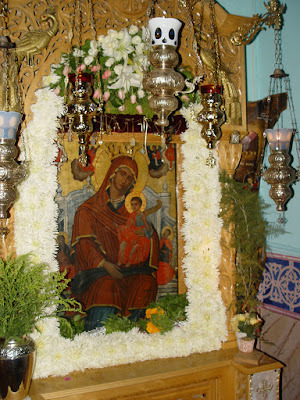 The icon of Panagia Vlochaitissa, or Panagia Oraiotates, depicts the Virgin Mary enthroned with the Christ Child seated on her lap, surrounded by four prophets and two angels. This icon is a source of numerous miracles, which includes helping barren women bear children, and healing illnesses in a manner unexplained by modern physicians. It is truly an icon full of grace. One particular miracle is celebrated annually at this monastery on June 5th. In 1893, after many months of drought in the area of Aetolia, residents and priests of the town of Kainourgio decided after some days of fasting and going to confession to turn to their patron, Panagia the Vlochaitissa, and seek her help by going up to her monastery. A Divine Liturgy was celebrated and everyone communed, then they bore the sacred icon on their shoulders and processed with it down to the town of Kainourgio. There, in the town square, with tears in their eyes, they begged the Mother of God to deliver them from the drought that brought them much affliction, damaging their crops and drying up their wells. Then suddenly, the miracle took place. A cloud appeared over the monastery that brought down rain with it. It was the rain asked for by the residents. The inhabitants further reported that the rain only fell on the town of Kainourgio. They all glorified God. The elderly of the town even today remember the story as it was told to them by their parents and grandparents who were eye-witnesses, and they would speak of it with tears in their eyes. It was a clear indication of divine intervention on their behalf. In order to not forget this great miracle of the Panagia Vlochaitissa, an annual celebration was established on June 5th, when residents of the area go up to the monastery and celebrate the Divine Liturgy, thanking God and the Panagia for their covering and help and protection in their lives.